A 2008 chlorine leak at a public water park in Chicago sent several children to the hospital with breathing problems, blistering around their eyes and mouths, and skin irritation, according to Leslie K. Tamura writing for the website MedIll Reports Chicago. The risk of chemical burn dangers from excessive chlorine levels -- particularly from exposure to chlorine gas -- is especially high at poorly-ventilated indoor pools. Tony Burda, an Illinois Poison Center toxicologist, said in the article that chlorine is a poison and children may be more sensitive to high levels of the caustic chemical than adults. Homeowners and pool managers use chlorine in swimming pools to kill bacteria, reduce algae and control pH levels. Antimicrobial pesticides, which are swimming pool additives such as sodium hypochlorite or calcium that contain chlorine and other chemicals, are added to the water in granule, tablet or liquid form. Often, pool managers use machines that automatically release specific amounts of chlorine into the pool at timed intervals. Burda notes that the level of chlorine in the pool and the length of a child's exposure to it determines the severity of the reaction. 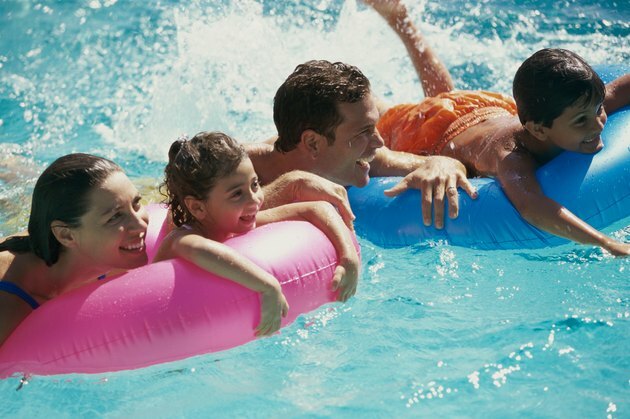 Chlorine levels in swimming pools and regular household products differ greatly. While household cleaners have about 2 percent chlorine content and bleach about 5 percent, swimming pool chemicals have 12 to 95 percent chlorine content since proper use of the product requires dilution with lots of water to achieve a safe balance. The American Chemistry Council recommends checking your local health codes governing the use of chlorine in pools and using the guidelines established by the Association of Pool and Spa Professionals for the addition and maintenance of chlorine levels in pools. Children who swim in chemically-treated pools are at increased risk of inhaling dangerous amounts of chlorine and related products, according to the Centers for Disease Control and Prevention. Since most dangerous exposure is through inhaling chlorine gas, the risk is especially high for children who swim often in indoor pools. High levels of chlorine, either through too much in the pool water or from the escape of gases, can cause severe irritation to your child's eyes, skin, nose and sinus. Exposure can cause respiratory problems and, if swallowed, throat burns. Chlorine can cause chemical burns to broken skin. Exposure to very high levels of chlorine can result in burns to a child's eyes, skin and throat and could result in death. You can protect your child from chlorine burns by following instructions for adding chlorine to your pool or by checking with the management at public or indoor pools about safety practices. Indoor water parks and pools should have air-control devices to remove moisture from the air and continuously take in fresh air. Indoor pools can further ensure safety by using fans and open windows to improve ventilation. If the facility is designed to allow sunlight to hit the water, the potential for the build-up of chlorine gas is lessened. Exposure to chlorine gas requires immediate removal to an open area with fresh air and emergency medical attention. The Centers for Disease Control recommends rinsing eyes and skin with water to clear away the irritant. Leave the pool and notify management if there is a stronger than usual chlorine smell or if there is any irritation to the skin or eyes.